Argonaute 2 antibody recognizes argonaute 2, also known as PAZ Piwi domain protein, PPD, eIF2C 2, eukaryotic translation initiation factor 2C, or protein slicer. Mouse anti Human argonaute 2 antibody recognizes argonaute 2, also known as PPD, eIF2C 2, eukaryotic translation initiation factor 2C, AGO2 and protein slicer. AGO2 encodes a member of the argonaute family of proteins which play a role in RNA interference. The encoded protein is highly basic, and contains a PAZ domain and a PIWI domain. It may interact with dicer1 and play a role in short-interfering-RNA-mediated gene silencing. Multiple transcript variants encoding different isoforms have been found for AGO2 (provided by RefSeq, Sep 2009). 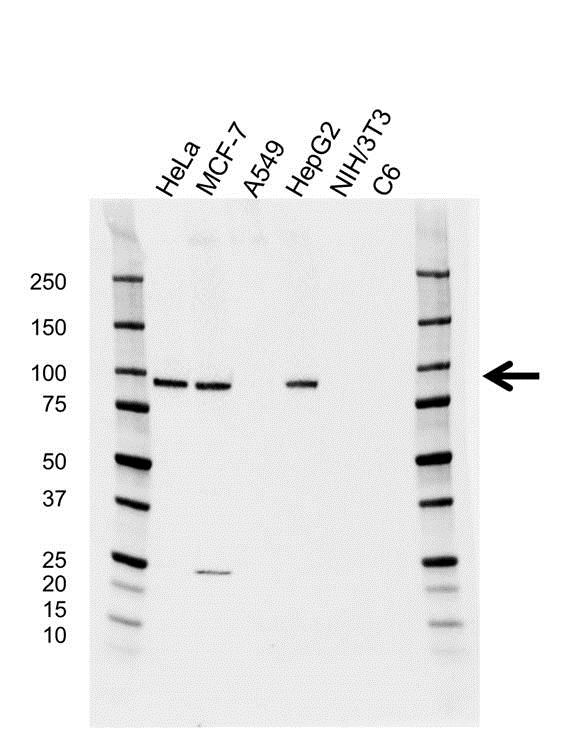 Mouse anti Human argonaute 2 antibody detects a band of 90 kDa. The antibody has been extensively validated for western blotting using whole cell lysates.